DO NOT discuss your suspicions with anyone within your circle of influence. Contact us from a place outside of your area of concern. If you feel there is a possibility that your computer or mobile device has been compromised, then use a computer or mobile device other than your own when possible (i.e. friend’s computer, library, cyber cafe, etc.) to Contact ComSec. We recommend that you create a “sterile e-mail address” (i.e. Yahoo, Gmail, etc. ), and use this email for all correspondence with ComSec. Complete our secure contact form, referencing your sterile email address and the appropriate phone number. a) ComSec will review your contact form and contact you by the method identified on your form. 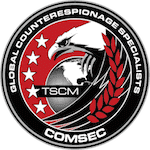 b) ComSec will prepare a service quote/service agreement, and provide you with additional information about our company and services as requested. c) Upon receipt of the signed quote and payment, ComSec will schedule your service for the agreed day/time, and make travel arrangements. d) We will provide you with our travel details. e) You must provide us with arrival instructions, point of contact information, etc. specific to your needs for our arrival. We typically recommend meeting in a public place near the survey area to discuss the process we follow when on site.